Inverse hockey stick in the lower troposphere – real or not? | Watts Up With That? Inverse hockey stick in the lower troposphere – real or not? Many people have noted on the satellite temperatures webpage the plunge in temperatures as recorded by AMSU channel 5 on the Aqua satellite. Since it looked pretty suspicious, I decided to investigate. Clearly, Aqua AMSU ch 5 is now “out to lunch”. 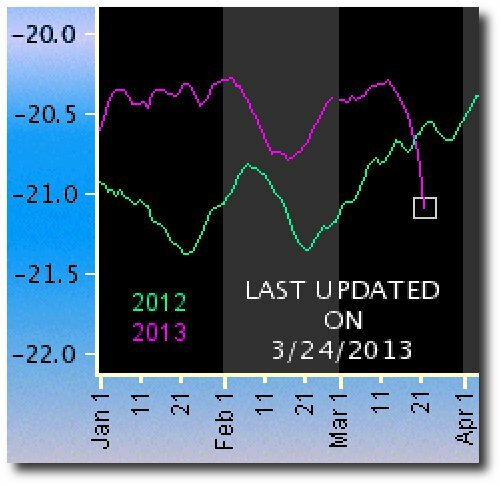 The reason why the plunge in Aqua temperatures in the above plot is so much stronger than what is displayed on the daily update website is that the latter shows running 3-day averages, and is only updated through March 23. We knew that this channel has been slowly failing for a long time, which is why we have not been using it in our monthly updates. We will discuss the possibility of switching to the NOAA satellites on the website, although since the site is NASA-funded, they are reluctant to spend resources on NOAA satellite data. But, given the popularity of the page, we will work something out even if we have to make our own web page. Now if it had failed in the opposite direction, it would be the basis of a “solid paper” for AR5. Looks like “backhoe fade” to me. Hmmm…. wonder who funds NOAA and NASA? I’m an ordinary guy. I didn’t know of the existance of Aqua Amsu till it failed. I knew satellites were providing us with the most reliable data we have. I appreciate the unsung service of this technological marvel and the genius of its masters. Roy, would you be willing to write a brief guest post about this device? It’s life, capabilities, achievements? What it’s done and how itdid it? I’m sure Anthony would post it. I guess that ch5 is one channel from the satellite? What do the others measure and are they going too? I mourn the loss of this device I hardly knew. I’d love to hear a eulogy from those who knew and maybe loved her. For God’s sake, don’t tell Michael Mann! If he can turn the Tiljander sediments upside down, there’s no telling what “Siltdown Mann” could do with this! Peer reviewed and published In Science. Leo nice words, I share your sentiment. It looks like several of the channels are exhibiting similar behaviour. It’s hopeless. Nobody is going to pay for upside down hockey sticks. Er, well… OK you got me on that one. Gary, “Siltdown Mann”? That’s amazing! Josh? It may well be real beause its still within the range of other yearts data? If other channels are showing same then it is probably REAL. Per Mann just invert it then it will represent real phenomena. I know we’re treading on risky ground concerning a particular individual with our witticisms about him, given his propensity to lawyer up, but he’d better think twice about suing us lest his fabrications be brought to light at trial and his whole world consequently fall apart. If Marcott could get away with bad data supporting his contention, perhaps we could use this data to support Archibald’s global cooling …. Having just enjoyed (well, yes, I did!) The Day After Tomorrow on DVD, I thought for one moment . . .
AMSU channel 5 does not agree with the model projections therefore it is a hardware failure. Hi, Anthony. This is for any data-oriented readers who might be interested in solving a minor satellite-data mystery. At least it’s a mystery to me. That’s an old blog I started but I quickly ran out of time and abandoned it. I never figured out whether the apparent data oscillation was real or just an artifact of the satellite data analysis process. If it is an actual phenomenon then I’m really stumped about its nature. Excellent job you, Steve, Lucia and others are doing on reviewing climate issues. I’m the one, BTW, who used to comment and post regularly about hurricanes at Climate Audit several years ago. Just treat it like an upside-down proxy and wheeeeee! Catastrophy! I am surprised that the usual suspects have yet to use this to flummox reality and produce some tabloid climatology. Looks like an Earth hour interest graph = Dropping like a stone! Well, la dee dah! Whenever we have a joint project with NASA, their PR machine cranks out the press releases hardly ever mentioning their NOAA partners. Now the shoes on the other foot they couldn’t be bothered because they might have to mention they’re using NOAA satellites. Thanks, pals, we’re all in this together. It reminds me of the time-vs-current plot for a superconductor as the refrigerant ran out. …, the overall weather pattern into the first part of April will continue to run about a month or so behind schedule. March behaved a lot like a typical February, and it appears the first half of April will be what March should have been like. I have to admit, I was sort of excited! It’s the same on ch’s 6, 7 & 8. Do they use the same satellite? Record March cold in Europe and North America! Historical proportions. Who’s zooming who? can’t they just adjust or improve this somehow…. It’s CAGC (Catastrophic Anthropogenic Global Cooling)! We were told authoritatively, by Professor John Beddington, on the BBC today, that the severe cold in UK is caused by too much CO2. Looks like he was right! And Mr Mann was right too (but he just got his hockey stick upside down, that’s all – an honest mistake that anyone could make)! Roy’s plot of the two NOAA satellites AMSU5 (see above) shows a similar fall in 600mb GAT. While unusual, a fall of this rate/magnitude in March is not unprecedented, see March 2004 & 2007 for similar events. It will be interesting to watch what happens for the rest of the month. It dropped another half a degree today so I think it is now pretty obviously a malfunction. Hopefully, we get the newer satellite data soon. My vote is yes–the failure has been driving the recorded temps higher making a bitterly cold December and January in the NH look as if it were above the anomaly. I have wondered and whined about this here at WUWT and Dr. Spencer’s blog several times–we have had a bitterly cold NH winter with record breaking cold all over the place and the satellite data reported that we were above the anomaly… Dr. Spencer, could you revisit this? He he he–lets do it! “Currently using Central England Temperature (CET) data the mean temperature for March is a fraction under 3.3C.” That’s a 38F mean! There is now everywhere more snow than 5 years ago. In the past cold weather in Europe correlated well with warm weather in North America and vice versa. Now it is cold in Europe, the US and Asia. Dare I say it? It’s unprecedented! How bizarre. It was my understanding that these satellite systems were programmed to display higher temperatures upon catastrophic failure, so that their data would not have to be eliminated from the record. So if it was known to be faulty, why was the plot allowed to continue? I am sure this Thing of the Past is nothing but a sensor error as well. People like Village Idiot predictably cast doubt on satellite data knowing that it is the only way to measure global average temperature without homogenizing urban heating into large areas. They can’t be denied their 0.2C per decade even though that itself doesn’t ensure catastrophe. The “Year to Date” CET negative anomaly will, within several weeks, almost certainly surpass anything seen since the 1880’s. More importantly, the Northern Hemisphere cold is widespread and severe. It will be interesting to see how the Instrumental vs. Satellite data depict this in coming months. There have been weird and extreme weather patterns in the N hemisphere this winter, but while the temperate zones are unusually cold, the Arctic is unusually warm. Part of the ‘Lance Armstrong’ climate and caused in part by the increased variation on the path of the jet streams as the temperature difference between the temperate and arctic regions is reduced. These extremes, coldest winter in N hemisphere and hottest summerin the S hemihere are just the sort of thing that is predicted from climate changes. From past viewing the AMSU graphs 600mb changes are usually about twice those of the 400mb so the decline maybe not be too far off but probably exaggerated by technical error. To Michael Mann that is some solid data. Izen, the Eath’s global temperatures have been flat for more than a decade. That is just the sort of thing not predicted by climate change. izen said “These extremes… are just the sort of thing are is predicted from climate changes”. What is predicted is a less variation in the polar jet because a stronger (and thus less variable) jet will be produced by a lower continent to ocean temperature gradient (mainly within the Arctic) and other reasons. Actually they have risen slightly over the last decade, but the expected rise from CO2 forcings of around 0.14degC is swamped by very large ENSO variation nearly an order of magnitude bigger. That is an effect which is absolutely predicted by climate change science. It has been an oft repeated mantra that short term variation will obscure the small long term trend. When Hansen predicted warming in the late 80s he was quite explicity that it would be after 2000 before the warming would be apparent above the shor-term variation. izen, extreme storms and ongoing droughts are created by weather patterns, not by “accumulated energy”. Energy does not “accumulate” except in the ocean, and now we know that’s mostly the deep ocean where that accumulation is simply irrelevant (warms very cold water very slightly). The energy of the earth’s atmosphere fluctuates greatly in local areas and for the planet as a whole. Weather is mainly a cause of those energy fluctuations (far exceeding any by CO2) and not an effect. Izen, you are joking right?? Hansen’s 1988 prediction is way beyond falsified for scenario A. Only the tin foil hat AGW alarmists still treat that with any trust. But it’s actually funny you are almost admitting the natural variations are way above what the CO2 signature is suppose to be? History has shown us that of course, that the natural variability is large. The Ocean heat content since modern measurement systems were deployed is also no where near the modeled values. Unfortunately, the answer is, the Federal Reserve, by buying bonds with IOU’s. Yes, to see if the spread between the two changes will be informative. Izen, there is no increase in weird weather, be it hurricanes, droughts tornados etc. 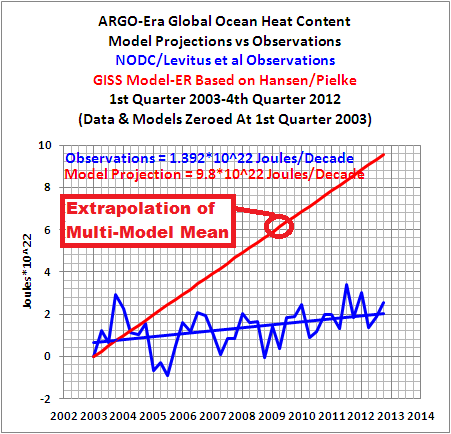 CAGW is now so distorted that they have predicted anything that may happen. More snow, less snow, bigger frogs, smaller frogs, CAGW does it all. The lack of global warming for nearly 2-decades violates every tenant of greenhouse theory. Clearly, another factor or factors must be at work. Also, a decrease in temperature gradient between the poles and tropics must result is less meridional flow, and less climate variability. 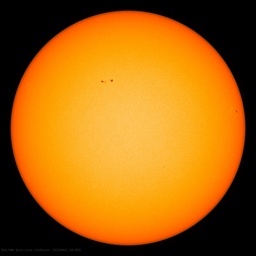 The AGW alarmist have, out of desperation, attempted to confuse the public on this.